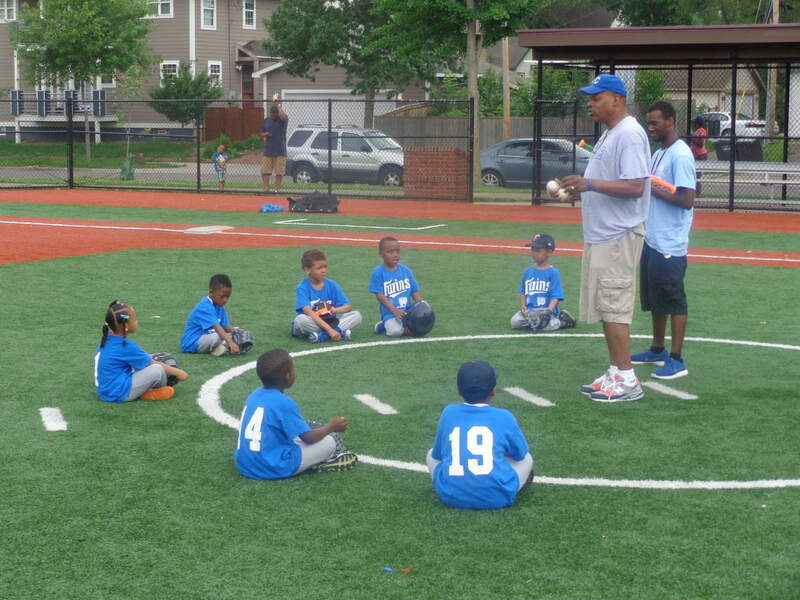 Some might use his T-Ball classes as a convenient one-hour drop-off center, but longtime North Minneapolis-based youth coach Mat Talley is actually okay with that. “I tell the parent, ‘Give me your kid and you go shop. Don’t worry about it — he or she is going to be alright. Go run three errands — Coach Talley got them.’ I don’t mind — just come back on time,” he stressed during a break at the North Commons baseball field at 16th and Morgan North. Twice a week, Talley takes charge of about a dozen four-, five- and six-year-olds, including three girls, and is teaching the youngsters baseball fundamentals through T-Ball, where kids hit the ball off a stationary tee at home plate. “Just to be together in the hour that we have, because I believe in bringing kids together… If nothing else, I get them away from their parents for an hour. They probably appreciate that,” stated Talley. They‘re perhaps too young to play regular baseball, but Talley quickly points out why it makes sense to start them out now on the right track. “They seem to be having a wonderful time,” he noted. His young troops practice on Wednesdays and play other T-Ball teams on Saturdays. “We play the Northside parks… We’re hoping next year to integrate with the Northeast teams” and eventually become part of the city-wide Park Board-sponsored T-Ball circuit. On this late Saturday morning, it looked like the other team was a no-show. “If the team doesn’t show up, we still are going to hit the ball — we are not going to get in our cars and go home,” said Talley before having each player take his or her turn at the tee. The players later ran the bases a couple of times before they broke for snacks brought by a parent. To develop baseball players, especially among inner-city Black youths, “You have to start with the fundamentals,” said Talley, whose mission to grow baseball began a couple of years ago, first by convincing North Commons Park officials to support it, then recruiting parents to do so as well. If only for a couple of hours a couple of days each week, the North Commons field becomes a safe haven for the kids. Talley isn’t naïve, however — a shooting recently took place just a block away. A few days earlier, shots rang in the Golden Valley Road and West Broadway vicinity on the same evening a community prayer service was held in the parking lot a few blocks away. Keep up the good work coach Talley! Love how you are teaching the game to these young kids!